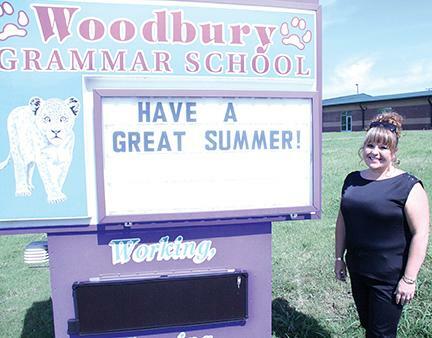 Students in Shannon Streett’s sixth-grade Woodbury Grammar classes will be extra fired up for the return of school next month. Not only has Streett been named a finalist for Teacher of the Year in Tennessee, but Blue Bell will also provide her students with an ice cream party as a result. “My students have been excited for me during this process,” Streett said. “They get pumped and they want a vote. They get excited because they feel it is a measure of success for them. They know I couldn’t do it without my co-teacher Steven Smith. We work in tandem and try to make learning as fun as possible. Streett, who teaches sixth-grade English/language arts and science at Woodbury Grammar, has been named one of nine finalists for Tennessee Teacher of the Year. She was recently named Upper Cumberland Teacher of the Year to advance to the final step. Streett is one of three finalists in the Middle Tennessee region, joining Tracy Harmon, Franklin High School; and Chris three regions – West, Middle and East with three finalists in each. One winner will be selected from each of those “grand divisions” and the Tennessee Teacher of the Year will be chosen from that trio. The nine finalists will have the opportunity to join the State Education Commissioner’s inaugural Teacher Advisory Council. Members of this new body will offer insight, feedback, and advice on issues that impact teachers across the state. Education Commissioner Kevin Huffman said advice from teachers is critical. “Seeking feedback and advice from our Teacher of the Year finalists is a critical step in ensuring that we are learning from and listening to teachers from all regions of our state,” Huffman said. Bonnie Patterson served as Streett’s Principal at Woodbury Grammar four years. Streett credits Patterson as someone who has inspired her career. Director of Schools Barbara Parker called it a huge honor for Streett. The final winner will represent Tennessee in the National Teacher of the Year competition and is an ambassador for education throughout the year. To qualify, candidates must have been teaching full-time for at least five years, have a proven record of using creative, research-based teaching strategies resulting in measurable achievement, and be effective school and community leaders. A panel of professional educators from across the state scored applications to identify the nine finalists.